Senator Fraser Anning has had a second fiery confrontation in Melbourne after having an egg cracked over his head yesterday. 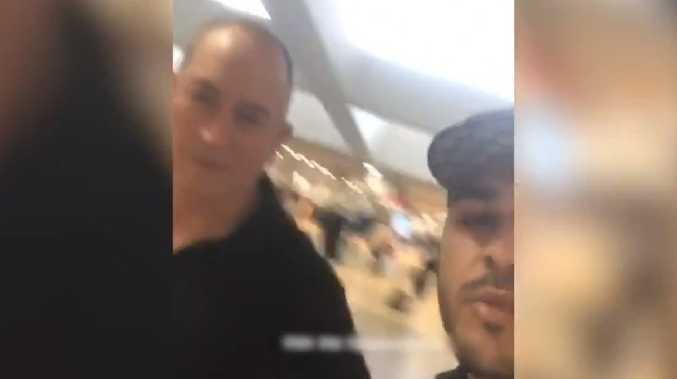 Roxburgh Park's Ali Bidiri confronted Mr Anning at Melbourne Airport last night, asking whether he had "any remorse" over controversial comments in the wake of the Christchurch terror attack. Footage posted on social media appears to show Mr Bidiri, 20, approach Mr Anning as he prepares to board a plane. "Don't you have any remorse? don't you have any f***ing remorse?," Mr Bidiri said. Mr Anning repeatedly tells Mr Bidiri to "stand back" before he calls him a "maggot". "I was born and raised here and to have someone that is supposed to be representing my country in the Senate to have so much hate towards people of my faith really hurts," he said. "I just felt the need to speak to him. There's no other way to directly speak to him, you can email him but can't get direct answers." Mr Bidiri added: "He called me a maggot. To call people he is representing a maggot is pretty bad". The confrontation came hours after Mr Anning had an egg cracked over his head by a teenager. The 17-year-old, dubbed "egg boi", was arrested but later released pending further inquiries after egging the Senator at an event in Moorabbin yesterday afternoon. 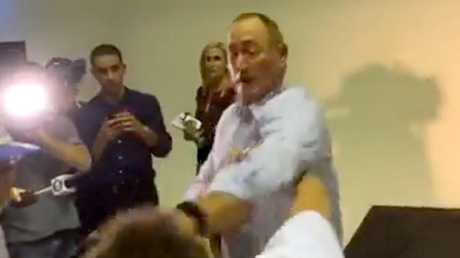 It sparked a heated confrontation with Senator Anning and several of the Senator's supporters who jumped on the teen and tackled him to the ground. Videos of the clash have been widely circulated online. Footage shows the teen casually walking up behind the Senator and cracking the egg on his head while holding his camera in front of him to film the incident. The Senator then turns around and lashes out in retaliation, slapping the boy in the head before punching him in the head. A group of Senator Anning's supporters then pounce on the boy. One man in a singlet grabs him in a choker hold before pinning him to the ground as others converge. The incident happened about 3pm and by 4pm a GoFundMe page was launched for "egg boi", with money raised to cover any legal fees and to help him buy "more eggs". Within hours the page had whisked up thousands of dollars in donations and attracted dozens of messages of support from people labelling him a legend and a hero. 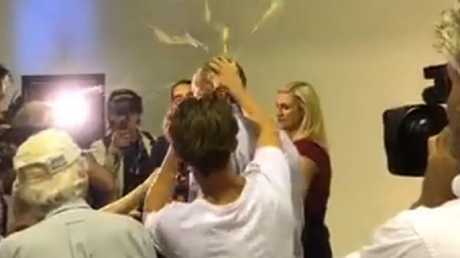 Senator Fraser Anning had an egg cracked over his head by a protester. The page praised him for "taking on" Senator Anning, who was "despised around the world for comments made after the shooting at a New Zealand mosque". Victoria Police said in a statement they arrested a 17-year-old from Hampton for allegedly assaulting a 69-year-old Brisbane man by breaking an egg on his head. "Police at the front of the venue were notified, attended and arrested the 17-year-old shortly thereafter. "The teen was removed from the premises and his details were taken before he was released. "The incident is being actively investigated by Victoria Police 'in its entirety' including the actions of the 69-year-old man and others." The teen was released pending further inquiries and the investigation was ongoing, the statement said. The event where the incident unfolded was titled "Fraser Anning speaks out on African gangs" and was attended by several far-right figures, including activist Neil Erikson. It came one day after the widespread backlash over Senator Anning's statement where he appeared to blame Muslim immigration for the terror attacks in New Zealand where 49 people were killed. In the statement Senator Anning said: "the real cause of the bloodshed on New Zealand streets today is the immigration program which allowed Muslim fanatics to migrate to New Zealand in the first place". 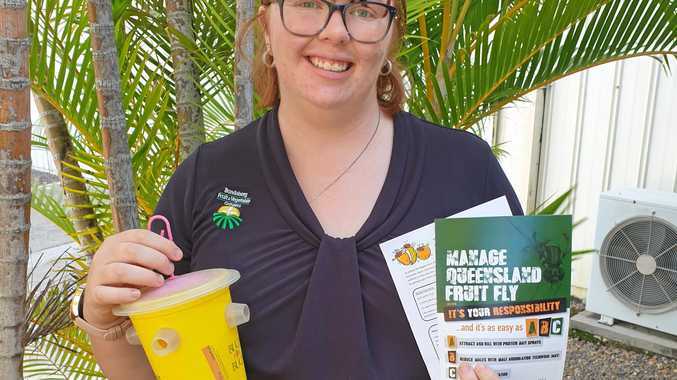 His words were widely condemned, with Prime Minister Scott Morrison describing it as "disgusting". "The remarks by Senator Fraser Anning blaming the murderous attacks by a violent, right-wing, extremist terrorist in New Zealand on immigration are disgusting," Morrison tweeted. Senator Anning's statement has since been removed from his social media accounts. Speaking to the Sunday Herald Sun today, Senator Anning said the backlash was unprecedented. "I don't know what the backlash was all about. I condemn it [the attack in New Zealand]. I've never advocated for any violence in my life and never would. It's a disgusting act." 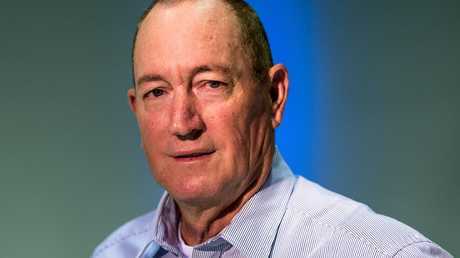 Senator Anning said his view hadn't changed in his career as a Senator and he made no apologies for his comments. "Too bad if people don't like what I say then they'll just have to live with it." He denied his words were hate speech. "I'm just saying what a lot of people I know and people I grew up with, they believe that Muslim immigration isn't good for this country." "Hate speech is only if anyone tells the truth - left wing class that as hate speech." A Facebook page for the event had over 800 people listed as interested in attending. Protesters gathered outside and walked down the street to the venue. Many held signs and wrote messages on the pavement in chalk. Christopher Johnson, who was with protesters from the Yelling At Racist Dogs group, said he was there to oppose the "white supremacist and anti-Muslim rhetoric". "I was disgusted by the Senators inaugural speech and his comments after the terror attack in Christchurch yesterday," he said. "He has stood alongside neo-Nazis and advocates policies that seek to divide Australians. The very least I could was stand opposed to him and his vile supporters." He said the group held a peaceful protest on the nature strip outside the venue. One message read: "Islamophobia is Terrorism". Meanwhile, Senator Anning will be condemned by the Senate for his comments when Federal Parliament returns next month. Government and Opposition senators will jointly move a motion censuring Senator Anning "for his inflammatory and divisive comments seeking to attribute blame to victims of a horrific crime and to vilify people on the basis of religion". The motion will also call on all Australians "to stand against hate and to publicly, and always, condemn actions and comments designed to incite fear and distrust". Censure motions cannot be used to boot members from parliament, but are thought to send a strong message of condemnation and political embarrassment. Anning shoved the man and he was restrained until he could be arrested.